Home / Medical Cannabis Guide / What are Cannabinoids? The cannabis plant has been cultivated for tens of thousands of years. Early civilizations first learned of the plant’s sturdy stalk being useful in producing ropes and twine, as well as the healing powers of the whole plant from root to flower. The chemical makeup of the plant varies throughout its life cycle and contains over 500 compounds. A little less than a fifth of these compounds are known as “cannabinoids.” These are natural products of the plant that are mainly found in the female flowers. There are six principal cannabinoids that researchers today are interested in, with the main two being ? ?-tetrahydrocannabinol (THC) and cannabidiol (CBD). Delta-9 tetrahydrocannabinol is the principal psychoactive component in cannabis. It is because of THC that many users utilize the plant to produce feelings of euphoria or to get “high.” Many strains of marijuana today are bred to have high levels of THC. This cannabinoids has many medicinal benefits; however, ingesting too much can cause feelings of paranoia and anxiety, especially in those not accustomed to using it on a regular basis. 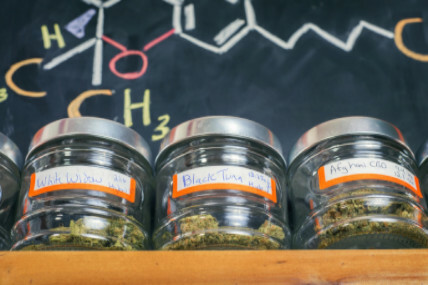 The actual percentage of THC found in strains can vary widely. Testing by researchers in Montana discovered an average of 13.5 percent. However, the levels widely ranged from 2-21 percent. For medicinal uses, this range has been shown to provide neuroprotection and pain relief, and the FDA has approved the use of it as an appetite stimulant for those suffering from HIV/AIDS. THC has also shown to be antiproliferative (prevents the spreading of cells) and antispasmodic. Cannabinoids attach to endocannabinoid receptors in the body that are activated by anandamide, a neurotransmitter. These neurotransmitters act to fill the synapses (gaps) between neurons, effectively becoming an on-off switch for bodily functions. Chemicals like THC can interfere with these actions, or they can also mimic the neurotransmitters themselves. In the past several decades, cannabis has been widely used as both an illicit drug as well as medicine. This reason, along with improved cultivation methods, has led to concentrations of THC in the flowers to increase to a median percentage of 11 by dry weight, although some strains can exceed 23 percent. This is not the only change; the cannabinoid content of these strains vary widely as well, not to mention the look and scent of the plant and flowers themselves. Due to this wide disparity, it is imperative for patients to know the chemical makeup of the strains they are interested in to determine which would be most effective for their condition(s). Of particular note would be the level of THC in the strain as well as the THC:CBD ratio. Unfortunately, medical cannabis is not regulated by the Food and Drug Administration (FDA) yet, and there is no such thing as a nutrition label on marijuana products so that the contents are obvious. Until there are more stringent procedures in place, patients need to educate themselves and align with a reputable dispensary with knowledgeable associates that can assist them.